This place was aMaze-ing! Maze is a Gordon Ramsey restaurant in Midtown Manhattan's London hotel (the original is in London) that we lunched at before heading to MoMA last Fall. The decor is not overly spectacular - basic and slightly sparse but light. 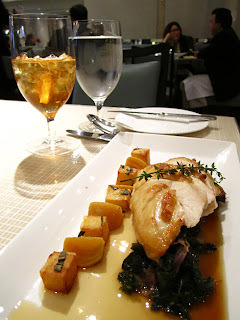 The staff was superbly attentive without being overbearing. But the food, aahh, the food. We started with a salad of marinated onions wrapped in butter lettuce with a mustard vinaigrette - nice and light. 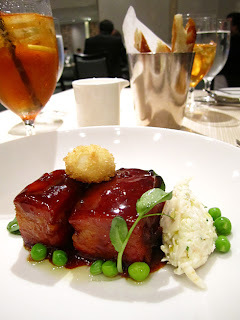 For main course I chose a fantastic crisped pork belly with new peas and a fresh slaw - perfect choice with a sweet honey glaze and super crunchy skin (unfortunately it's no longer on the menu). Jen went with the Amish chicken breast with gaufrette potato and greens - also perfect, not dry and well juiced. 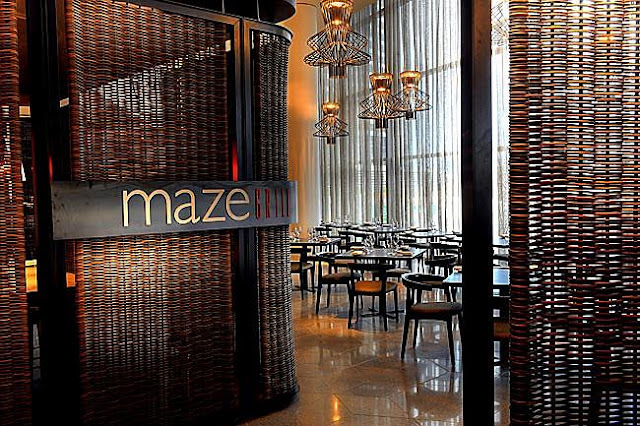 I think we can both recommend Maze for a great lunch and definitely plan to try it for dinner. 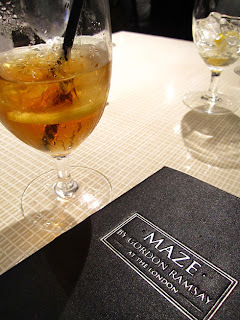 I've heard that the Maze in London is far superior so that would be something to try if and when we make it there. Sounds yummy and the salad sounds intriguing.